Large Antique Silverplate Altar Vases Pair Catholic Church Vintage Silver IHS. 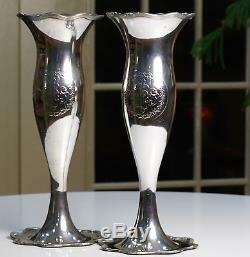 Simply STUNNING antique silverplate altar vases ca. These are unmarked but likely French. They are large at 15.5 inches tall. These are more commonly seen in brass which is most often worn, but these silverplate vases have held up exceptionally well. We carefully polished these with professional Simichrome metal polish to clean them and bring back their beautiful luster. Under the tarnish we found them to be in splendid condition, with no wear to the plating, scratching or dents. The photos do not do these wonderful pieces justice - they literally glow. The item "Large Antique Silverplate Altar Vases Pair Catholic Church Vintage Silver IHS" is in sale since Monday, January 4, 2016. This item is in the category "Collectibles\Religion & Spirituality\Christianity\Other Christian Collectibles". The seller is "perfumepoodle" and is located in New Haven, Connecticut. This item can be shipped to United States, Canada, United Kingdom, Denmark, Romania, Slovakia, Bulgaria, Czech republic, Finland, Hungary, Latvia, Lithuania, Malta, Estonia, Australia, Greece, Portugal, Cyprus, Slovenia, Japan, China, Sweden, South Korea, Indonesia, Taiwan, Thailand, Belgium, France, Hong Kong, Ireland, Netherlands, Poland, Spain, Italy, Germany, Austria, Israel, Mexico, New Zealand, Philippines, Singapore, Switzerland, Norway, Saudi arabia, Ukraine, United arab emirates, Qatar, Kuwait, Bahrain, Croatia, Malaysia, Chile, Colombia, Costa rica, Panama, Trinidad and tobago, Guatemala, Honduras, Jamaica.